The Boston Celtics fell 98-86 to the Utah Jazz, snapping their two-game winning streak and wasting all the momentum they had gained with their primetime win over the Raptors on Friday night. One of the more disappointing efforts of the season, the C's couldn't get anything to go from the field, and were woefully outworked and out-executed. It continues to baffle me how a team with this much offensive talent can have games that are so ugly on the offensive end, but Boston has made them their calling card early on. Donovan Mitchell led all scorers with 28 points, while Ricky Rubio added 20 points of his own. Kyrie Irving led the way for the Celtics with 20 points. Jayson Tatum (10) was the only other Boston player in double figures. Coming off the back of, arguably, his most impressive game as a Celtics, Irving wasted no time getting into the scoring sheet. An and-1 layup off of a nifty dribble move and a pull-up midrange shot started the scoring for Boston and the Jazz collectively sighed after realizing that there was going to be no big game hangover for Kyrie. 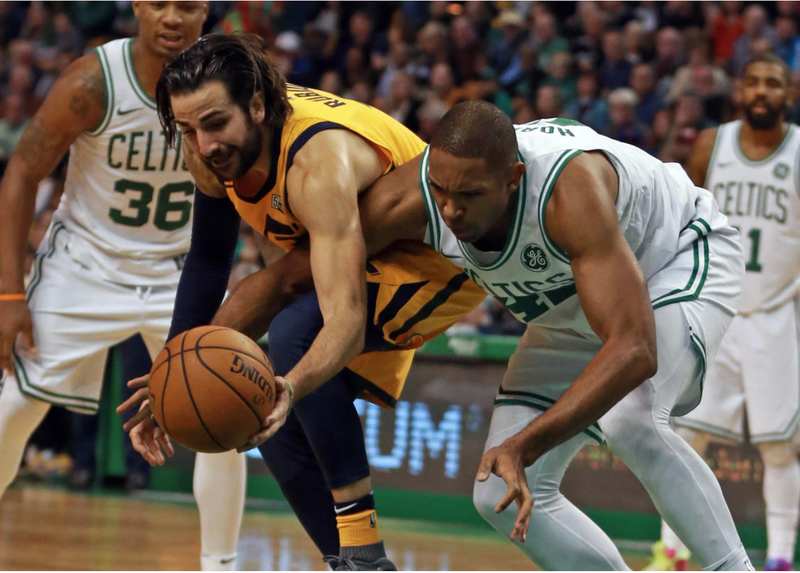 After a slow start on offense, just 1-7 to start the game, Utah found it's rhythm, thanks in part to an energy infusion from old friend Jae Crowder. Boston was uncharacteristically sloppy with the ball as the first quarter carried on. Five turnovers, many of which were unforced, led to several fast-break opportunities for Utah. After getting into the bonus with four minutes to play in the first, the Celtics were able to keep the game within a possession until back-to-back threes in the final 30 seconds from Mitchell and Royce O'Neal drove the Utah lead to 29-20 heading into the second. After knocking down a three late in the first, Mitchell continued to pour it in early in the second with five points on consecutive possessions. The Celtics got off to a slow start largely because of their three-point shooting and free throw shooting. The C's started 1-11 from beyond the arc and just 3-9 from the charity stripe. Continuing to let the Jazz get open driving lanes to the basket wasn't helping either. I don't think shooting 1 for 11 from the 3-point arc and 3 for 9 from the free throw line is particularly helpful if trying to win a basketball game. The Celtics used a 12-3 run over 4:00 minutes in the middle of the second quarter to draw the game within one possession. An Al Horford dunk cut the lead to one with just over two minutes to play, but two triples from Joe Ingles and Rubio stretched the lead back out to seven. Boston continued to cut into the lead, but the Jazz were always ready with a counter punch. Kyrie did his best to get the crowd back into it by crossing Rubio into oblivion, with the help of Horford's foot, but Boston went into the locker room down 50-45 at halftime. It wasn't by any means a clinic on offensive efficiency from the Celtics, but Jaylen Brown noticeably had a rough night from the field. Brown finished just 1-9 from the field, including 1-6 from three-point range. He has had flashes of his potential, but outside of Gordon Hayward and his understandable rust, Brown without a doubt has had the biggest struggle transitioning to his new role. The Jazz used a 13-6 run to open up a double-digit lead on the back of some more stellar shot making from Mitchell midway through the third quarter. With the Celtics already in a dire situation, Kyrie picked up his fourth and fifth personal fouls in a span of 40 seconds and was forced to sit for an extended period of time. After leaving the floor with 5:12 left to play in the third, the Kyrie-less Celtics scored just five points for the rest of the quarter. The offense looked stagnant and even the open shots weren't falling. A 4-0 start to the fourth quarter stretched the Utah lead to 19, the largest of either team to that point. With just under nine minutes to play in the game, Brad Stevens emptied his bench and presumably waved the white flag. But the third-stringers plus Kyrie scored four quick points and cut the Utah lead down to 13. The deep bench unit had a lot to prove, and you could see the energy and effort that they were bringing, but the deficit was too large, and with Utah still playing a number of their starters, the talent gap was too much to overcome. #Celtics are 1-for-17 on 3's in the second half. They missed their first 16 attempts. Kyrie sat down shortly after and the last six minutes of the game were glorified garbage time. A truly disappointing performance just 24-hours removed from a marque win over the top team in the Eastern Conference. The Celtics will get their next chance to right the ship on Monday, Nov. 19, against the red-hot Kemba Walker and the Charlotte Hornets.